WARSAW, MAZOWIECKIE, POLAND, April 12, 2019 /EINPresswire.com/ -- How many Polish companies sell and buy products online? What are their sales channels? How do they search for clients and business partners? How do global trends impact the Polish B2B market? What are the good examples of Polish and global B2B companies selling online? What is the future of B2B purchasing? 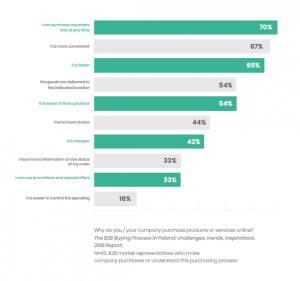 The answers to these and many other questions can be found in the recently released report “The B2B Buying Process in Poland: Challenges, Trends, Inspirations”, created by the technology and consulting company e-point SA and Mobile Institute, a research company. This was the first research project of its kind in Poland, prepared based on a Mobile Institute’s survey of 145 professionals representing companies operating in various sectors. The survey was conducted using the CAWI method (Computer-Assisted Web Interview) and extended interviews in September 2018. While the report is certainly useful to entrepreneurs active in the Polish market, it also provides a lot of universal insights that apply to companies across the globe. According to the report, 71 percent of Polish B2B companies sell their products or services online. A majority of those enterprises (65 percent) have been involved in e-commerce for over 5 years. Almost one in four (24 percent) has been engaged in online sales for 3-4 years, while only 1 percent of the surveyed companies have been selling products or services via the Internet for less than a year. 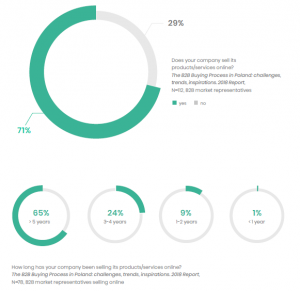 52 percent of B2B market representatives indicate that their company operates internationally. Company websites, where products or services can be viewed or purchased, account for 57 percent sales. Another frequently used distribution channel in B2B is direct sales – reaching customers through either sales representatives or the company website (54 percent). Companies’ own sales platforms, e-commerce platforms and ordering systems are in third place with 40 percent, followed by brick-and-mortar stores (36 percent). Every third company (34 percent) sells or distributes its products on social media. More than two-thirds (69 percent) of those surveyed buy products for their companies online. The most common reasons for doing so include making a purchase at a time and place of their choosing (70 percent), overall convenience (67 percent) and speed (65 percent). Moreover, as many as 36 percent of the B2B clients would like to buy products and services for their companies using a mobile device. Interestingly, price is not the key factor when B2B professionals choose a business partner, although 57 percent indicated price as decisive and 51 percent were influenced by others’ opinions of a potential business partner. But the most universal factor was by far good terms of cooperation (83 percent). This follows the global trend: B2B buyers value good customer experience more than price. Of the respondents, 96 percent operate a company website, chiefly used to present offers, share information and stay in touch with potential clients. The strategy seems to pay off, with companies that have invested in their B2B websites naming benefits such as: winning new business (81 percent), increasing sales (73 percent), and changes in how they communicate with clients (71 percent). Despite the widespread adoption of the B2B website, there is room for improvement in the Polish B2B e-commerce sector as only 49 percent companies sell their products and services via their websites, just 25 percent offer a showroom browser, and a mere 15 percent make useful tools (such as configurators, calculators or creators) available to clients. “In short, Polish B2B companies are choosing safe online strategies, but they’re not fully tapping into the potential for building relationships via the online channel,” commented Katarzyna Czuchaj-Łagód, Managing Director at Mobile Institute. This claim is confirmed by the Polish B2B companies’ attitude to implementing self-service solutions. Although they are very aware of how such solutions are useful to busy B2B clients, they prefer to nurture the business-client relationship and treat IT solutions as a means to this end. “This sets Poland apart from Western markets where leading research agencies forecast dynamic growth in B2B self-service. According to Gartner's study, by 2020 the average business client will be performing 85 percent of their purchasing operations without any human interaction. And according to Forrester Research, by 2020 the demand for B2B sales representatives will have shrunk by one million people – and that’s just in the United States. This is because business clients prefer to buy online, with only minimal contact with a salesperson,” commented Wawrzyniec Hyska, Business Development Director at e-point. The report also emphasizes that both the Polish and global B2B sector is undergoing a major transformation, driven chiefly by the Internet’s effect on customer behaviour. – “A large chunk of the purchasing process has moved online and new tools have appeared. However, a personal relationship between buyer and seller remains vitally important. New technologies support companies’ efforts to build and maintain strong relationships,” the report said. There are several examples of successful transitions to new business models by international companies in the report. You can also find there examples of how to turn major global trends and challenges in B2B e-commerce to your advantage. These trends include B2B consumerization and self-service, the use of mobile devices, business customers finding information and opinions online and the reviews of new IT tools in B2B commerce. The challenges the report focuses on are: competing in a global market and adapting to the emerging B2B2C selling model. This is a great report for any B2B company looking for inspiration on how to improve its online selling and buying processes. You can download it free of charge here: https://www.e-point.com/en/reports/b2b.